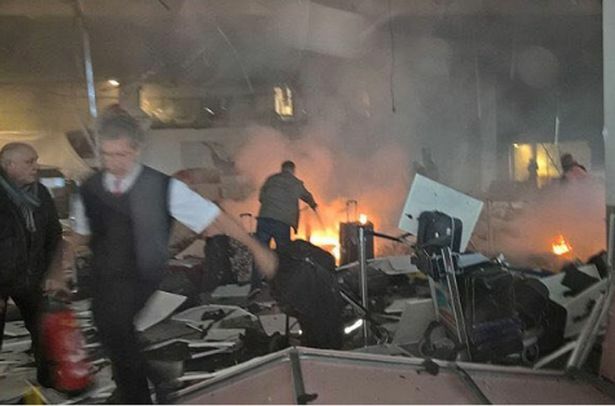 As far as we are able to ascertain at present the massacre at Atatürk airport on June 29 was the work of the Islamic State in revenge for Erdoğan’s change of policy towards them. In fact Erdoğan has realised that he has alienated practically everyone with his stupid and aggressive policy in pursuit of his own personal political interests as well as the imperialist interests of Turkey in the region. This is why he has decided to distance himself from a jihadism now in retreat and facing serious difficulties. Until recently he had given it a deal of support, both in terms of funding and weaponry, and by allowing its militants the free run of Turkish territory. He has now abandoned this collusion with jihadism, and tempered his aim of overthrowing the regime of Bashar al-Assad quickly, whilst mending relations with old allies, which have been distinctly bad for the past two years. With Russia he is trying both diplomacy (he wrote a letter of apology to Putin for the downing of the Russian fighter), and economic strategy, over the construction of the Turkish Stream pipeline that was fated to remain on the drawing board after the crisis with Moscow. We should not forget that one of his main aims is to strengthen the role of Turkey as the oil and gas energy hub of the Mediterranean, linking the Asian part of Russia with European supply needs. He has also resumed contact with Israel to revive their old military alliance and, therefore, reconnected the threads of a rocky relationship with the United States, given both the American decision to lift the embargo on Iran, his arch-enemy, and the Turkish decision to build a strategic pipe line with Russia that would replace the failed South Stream. In addition, the Erdoğan government had agreed to a US request to grant free passage to Kurdish troops to pass through Turkish territory, to fight the Black Caliph’s army. The massacre in Istanbul could be, therefore, the desperate attempt of the IS or its local subsidiaries, to show that they are still strong and can strike anyone at any time, when it is fighting for its very existence and has also been abandoned by the last of its allies, except for some in the Emirates and, as ever, Qatar. Obviously these are initial hypotheses hot on the heels of the event, which have to be confirmed. We also need to check the level of the class struggle in Turkey, the return of Kurdish nationalism in the shape of the PKK, and its “crazy” splinter, the TAK (Kurdish Freedom Hawks), which has carried out terrorist actions for the past two years claiming at least three suicide bombings with dozens of deaths in Ankara and Istanbul. We also need to check on the role of trade unions and, not least, the capacity of resistance to the Erdoğan government. From the intervention of Russia to the present the Islamic State has not only reduced its ambition to build more jihadist states but, is losing ground everywhere. This is not just a metaphor. In around twelve months it has lost 40% of the territories it conquered in Siraq, including important cities like Falluja and Palmyra, whilst its "capital" Raqqa is in danger. The advance of the regular Syrian and Iraqi armies and Kurdish and Iranian troops, seems unstoppable. The Libyan "campaign" is winding down. Until a few months ago IS controlled about 180 kilometres of the coast near the city of Sirte controlling oil wells in the area. Today it no longer controls them, its troops are holed up in some districts of the capital of Cyrenaica and almost two hundred kilometres of Mediterranean coastline has been retaken by the new Libyan government of Serraj, strongly backed by the US, and the international coalition. The latter hope to redistribute Libyan oil revenue in order to stamp out the upheavals produced by the Islamic State. If this fails they have already developed a plan B which involves the dismemberment of Libya into three zones of imperialist influence. Everything is going according to script. As long as the jihadism of al Baghdadi was useful for the strategic interests of imperialist countries like the USA, Arabia, Turkey etc. against Assad, there was plenty of funding and space to manoeuvre for IS; with the Russian intervention which tipped the game in favour of Assad, things have changed. Even for the West the dictator of Damascus has emerged someone they have to talk with. Moscow has achieved its primary objective of saving its ally and with him the chance to remain in the Mediterranean thanks to the availability of Syrian ports. Saudi Arabia and Turkey, though for opposite and mutually conflicting reasons within the Sunni world, they are partially satisfied. For almost all the major imperialist powers of the Middle East using the self-styled caliph was not only no longer interesting in terms, but the mere fact of his presence in the region began to be a hindrance to those very individuals who had previously allowed IS to grow uncontrollably. Hence IS difficulties in carrying on its ferocious project, so that, it has been forced to retreat on all fronts and not just the territorially. That is why al Baghdadi has had to alter his strategy. Today his final cards are in a strong defence of his last "strongholds" like Sirte and Raqqa, and in a terrorist counteroffensive supported by playing the media to convince the outside world that the IS is still strong, whilst telling his supporters at home that you still need to kill and die because "another world is possible": that of Allah and of oil revenues. The massacres first in Istanbul, then in Dhaka, are more a sign of greater weakness than the symptom of an increased influence of jihadism in Islamic countries. Although, in the case of the Dhaka massacre, three things have to be pointed out. The first is that the perpetrators of the massacre have acted primarily against the government of Bangladesh, "guilty" of being insufficiently Muslim, colluding with the West and under the thumb of India's foreign policy. The second is that the terrorist action against Japanese and Italian businesses was aimed only at hitting the government of Dhaka via business and finance, to punish it for the brutal repression of political parties and organisations supporting domestic jihadism. In just the last six months ten thousand jihadist militants have been crowded into prisons across the country. The third is that the "commandos" who carried this attack out were not affiliated to the IS, but took advantage of the "brand name", allowing the IS itself to claim responsibility. This would mean that IS does not actually exist as an organisation in the countries where the attacks take place, but that jihadists there are fascinated by IS unless they are already part of the competing al Qaeda organisation. In any case, one thing is certain: the international economic crisis has accelerated imperialist aggression and the barbarism of war which, in turn, has triggered jihadism in whatever form it takes. One imperialism encourages another, and barbarism generates barbarism in a perpetual spiral that spins on the axis of the crisis of the capitalist system unable to escape from its tragic consequences. We are seeing a worrying escalation of capitalist barbarism. The crisis, far from being over is moving the various pawns of imperialism in the struggle to control energy commodities, with no holds barred, whether it is inflicted by the usual powers that dispute for supremacy in the area (USA, Russia, Turkey), or whether they come from the ambitions of a self-styled, but equally desperate, Islamic State which now pins its hopes on the terrorism of suicide bombings. The enormous economic and strategic interests that are moving in the Middle East are likely to trigger wars between states, civil wars, alliances of convenience, u-turns, betrayals and second thoughts, all depending on the current needs and long term imperialist perspectives of the actors. In the midst of so much barbarism a number of local bourgeoisies, mainly but not only Kurdish, are stirring. They are both subject and instrument of a war within a war, which goes beyond their interests and inevitably ends up being reabsorbed into the vortex of imperialism. However the war scenario develops the intended victim is the working class of the region which, with no prospect of an alternative to a capitalism that creates the crisis and its own "way out", war, ends up being crushed between imperialist giants. It either ends up as cannon fodder of some nationalist cause, or becomes cannon fodder in one of the many terrorist attacks. Either the working class (whether Turkish or Kurdish, or Syrian or anywhere else in the Middle East) starts to take an independent path, or the barbaric spiral of war and the attacks will continue their macabre path. It a long and terribly difficult road but pooling the meagre forces of revolutionary minorities, wherever they are, has to start right now in order to create the necessary political and organisational worldwide reference point for all those needs which arise from the crisis that capitalism is trying to hide, and which die without hope of an alternative in bourgeois society. By a trio of suicide bombers which have killed 43 and wounded 240 at time of writing. It a long and terribly difficult road but pooling the meagre forces of revolutionary minorities, wherever they are, has to start right now in order to create the necessary political and organisational worldwide reference point for all those needs which arise from the crisis that capitalism is trying to hide, and which die without hope of an alternative in bourgeois society. Thank you FD for your article. However it is your last point, which I quote above, which really caught my eye, the comment that "pooling the meagre forces of revolutionary minorities, wherever they are, has to start right now". And you don't mention it here, but you are also I think in favour of forming the Communist Party as soon as possible. Thanks for that. Yes, we are in favour of forming the World Party of the Proletariat (or whatever we call it) as soon as possible but this is not in our gift (or rather separate from where the consciousness of the class stands and as we have explained many times we can’t invent the class struggle). We know that the process of emergence of the party that it will take time and there are no immediatist shortcuts. Calling for it is part of our duty of trying to get "the meagre communist minorities" to focus on this through debate and discussion and where possible practically on the ground. And if we revolutionaries don’t call for it who else will? We don't have to change our analysis from the last 40 years (or in the case of Battaglia 70 years) to do this as we have never maintained that the counter-revolution was over and the "historic course" was towards revolution. We have read the ICC's 21st Congress where they finally face up to the error of their perspectives and this is to be commended. It’s a pity though that they don’t examine the method by which they arrived at those perspectives (the same one that was used by Vercesi in the debates in the Internationalist communist left in the 1930s and by Mark Chirik in 1945-53 in Internationalisme). All were spectacularly wrong in their estimation because all lacked a solid material analysis of where they stood. The ICC was founded on the premise that the revolution was round the corner and they had the organisational framework to be the “pole of regroupment” for it. Over the years and against all the evidence (and our replies to them) they persisted with ever more bizarre short-term discoveries (“the left in opposition”, “the Machiavellianism of the bourgeoisie”, “the years of truth” and finally when the whole perspective collapsed “decomposition” (which they still cling to)). Now that they have abandoned that perspective (which in my view was one of the big barriers to any understanding) perhaps the way is open for us to resume discussions. However, as they are still calling all the people who split with them (but who remain in revolutionary politics in one form or another) “parasites” (mainly because they still refer a lot to the ICC which I would have thought a cause for acknowledgement), and they continue to misrepresent our views (either referring to a past position of the CWO long before it helped form what is now the ICT or throwing in a one liner which grossly distorts what we say now) we are not that hopeful.